Operating system: Windows XP, Vista, 7, 8, 10. Free Space: Minimum of 50MB. Cach Memory: Minimum of 100MB. An internet connection speed of at least ADSL 2.5MB or Mobile 3G. Go to sye.co.il. 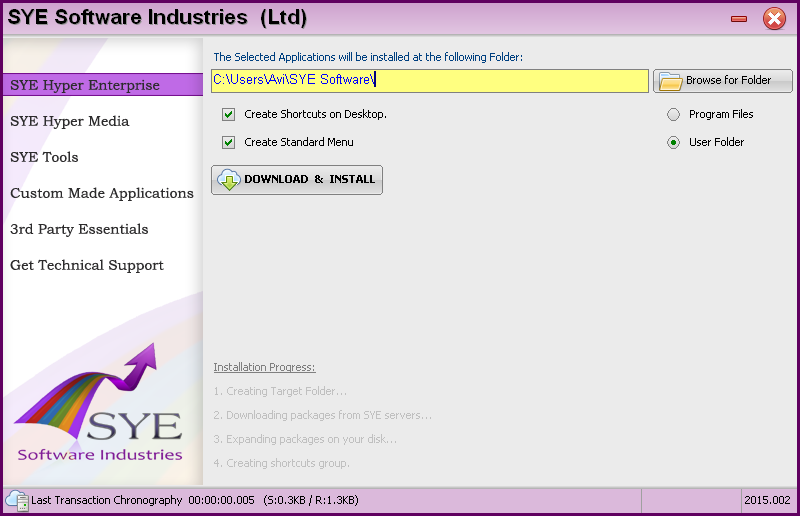 At the top of the page, press the Download the SYE Products Installer button. 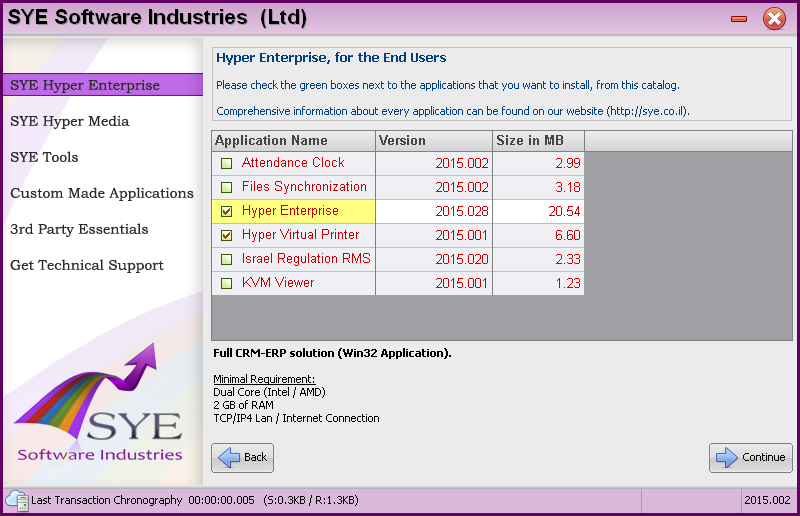 In the Sye Software Industries window, press the "Sye Hyper Enterprise" tab. Select the "Show Applications list for the END USER" and press the Continue button. After choosing the above applications, press the Continue button. In the last step, select the required path for the applications installation folder. It is recommended to install Hyper in the User Folder, in order to avoid Windows 7 security issues. Select the required shortcuts and press the DOWNLOAD & INSTALL button. 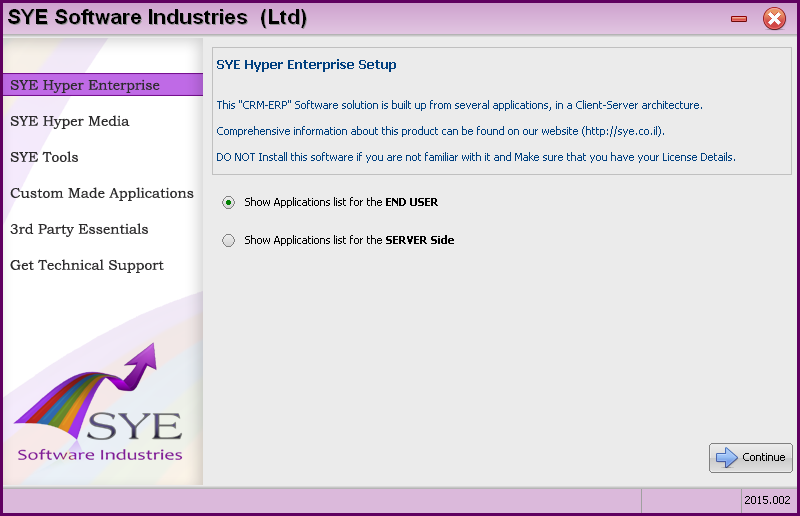 After the installation process is done, the primary menu of the Sye Products Installer will be displayed. Close this window and open Hyper by pressing the icon. APPL_Self_Upgrade - This program is responsible for the Updates and the initialization of Hyper. ChilkatDelphiXE.dll - This file is used for the encryption of Email messages and for connecting secured systems in SSL protocol. Hyper.exe - The execution file of Hyper. Hyper.ini - The definitions file of Hyper. hyper_english.trans - The translation file. .lic file - The license file. This file should be added manually to the folder. In case of multiple licenses, all of the files should be added to the folder. In the Log-in window, press the button. In the opened window (Connect to a NEW Database), fill in the "DB Folder" field with license name and the "Lic Download Password" with the license password. These details will be given by SYE Software Industries. Press the OK (F6) button and the Organization name will be automatically filled in the "Company / Organization Name" field of the Hyper Log-In window. In case that there are multiple licenses, the user can choose the required one from the list in the "Company / Organization Name" field. Fill in the username and the password and press the Login (F6) button. On the first Log-In, the username and the password are used for the current log-in only. The system must have an available internet connection in order to proceed. Please note - Security programs may sometimes block Hyper from connecting the internet or prevent it from writing to its folder on the local disk. In that case, contact the system administrator of the organization to check the authorizations and the connection definitions. When the installation is done, the user can log in to Hyper in "Setup Mode", by using the temporary username and password. For further information, press here.